Triple Self Portrait, a Norman Rockwell painting, appeared on the cover of The Saturday Evening Post published February 13, 1960. This is another timeless favorite of Rockwell collectors, a classic for the ages. This painting was Rockwell's first cover for The Post in 1960. In 1960, there were six Norman Rockwell Saturday Evening Post covers published. This was also Rockwell's 308th cover illustration out of 322 Rockwell painted for the Post. Rockwell's career with the Post spanned 47 years, from his first cover illustration, Boy With Baby Carriage in 1916 to his last, Portrait of John F. Kennedy, in 1963. The original oil on canvas painting, 44.5 x 34.375 inches or 113.5 x 87.5 cm, is part of the collection of the Norman Rockwell Museum of Stockbridge Massachusetts. The museum also posesses a pencil on paper study , 44.5 x 40.5 inches or 113.5 x 103 cm, of this illustration. on page 225 of and as color plate 23 of Norman Rockwell, A Definitive Catalogue by Laurie Norton Moffatt. Several studies were also reproduced in Norman Rockwell: A Definitive Catalogue on page 126. A photograph used in painting this illustration is reproduced in Norman Rockwell: Behind the Camera by Ron Schick on page 195, as well as the painting itself. 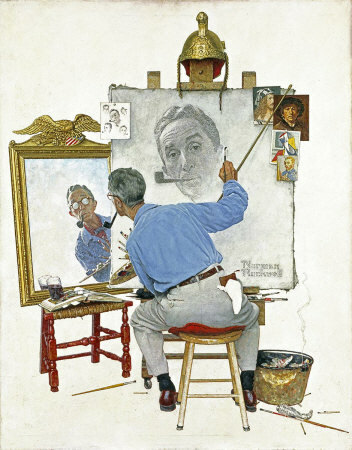 Triple Self-Portrait also introduced and commemorated the first chapter of Rockwell's autobiography, Norman Rockwell's autobiography, My Adventures as an Illustrator. The Saturday Evening Post published the first chapter of the book in this issue. I have seen pristine original copies of this magazine cover sell for big bucks on eBay. And to think it only cost fifteen cents originally! Of course, it was mint condition then, too. This is one of the most famous Norman Rockwell paintings. It is also a lot of collectors' favorite. Of course, it is named Triple Self Portrait, because there are actually three portraits of Norman Rockwell on just this one canvas. One of the reasons for its popularity is because it lets us see into the soul of the artist. It lets us see Norman Rockwell as he saw saw himself. Of course, the charcoal on the canvas shows Rockwell as he wanted to be perceived: handsome, caring, admirable. In reality, he posessed all those qualities and more. Yet the image painted into the mirrored portion of the illustration shows Rockwell how he actually perceived himself. America's favorite illustrator was a confirmed tireless workaholic. He either painted or worked on some other aspect of a painting almost every day for as long as he was able to work. The mirrored image shows Norman Rockwell scrutinizing Norman Rockwell. Working. Painting. In other words, an accurate representation. Rockwell painted only what he saw. One of his "limitations" was that he felt that he was unable to paint meaningful pictures solely from his imagination. He posessed a camera eye for realism, and that was one of his greatest strengths as an artist. So we can see that Rockwell knew himself. We can also see that he liked to poke fun at himself. On the right side of the easel, we can see photos of self portraits from earlier famous artists. Durer, Rembrandt, van Gogh, and, surprisingly, Pablo Picasso all occupy Rockwell's pantheon of self portraiture. Picasso surprises me because his works were so surreal whem compared to the camera-like visions that Rockwell usually produced. Norman Rockwell did not consider himself equal to the "Old Masters" or to Picasso. Of course, I believe his paintings were their equal, and actually superior in some ways. Certainly his storytelling skills were vastly superior. I also delight in the small details Rockwell always includes in his paintings. A glance at the trash can reveals a small billow of smoke. This is another poke at himself. Rockwell often dumped the ashes from his tobacco pipe into the trashcan. On more than one occaison, those ashes actually caught some oily painty rags, also usually found in the trash can, on fire. There has been some speculation that this is why one of his studios burned down. Triple Self Portrait was only one of 322 Norman Rockwell Saturday Evening Post covers; Here is the list of Norman Rockwell Saturday Evening Post cover illustrations. Other interesting details include the glass of soft drink precariously perched on top of the stack of open art books. The gilt frame of the mirror with the American eagle on top and the Roman-looking helmet on top of the easel are still other quirky embellishments. Other telling details, such as the sketches of the details of the painting and the paint brushes and charcoals on the floor, help induce the realization that this painting was indeed Realism incarnate, painted by the ultimate Realist himself. Do You Have A Great Story, Opinion Or Contribution About Triple Self Portrait?